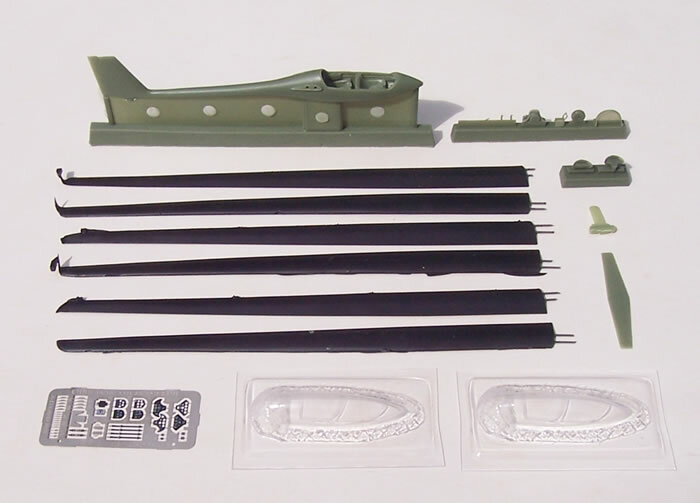 9 x green resin fuselage & tail parts, 6 x wire reinforced black resin wing parts, 2 x vac-form canopies, 1 x pre-coloured Eduard PE fret of 21 parts, 1 x Eduard pre-cut canopy mask, decals for 4 schemes. 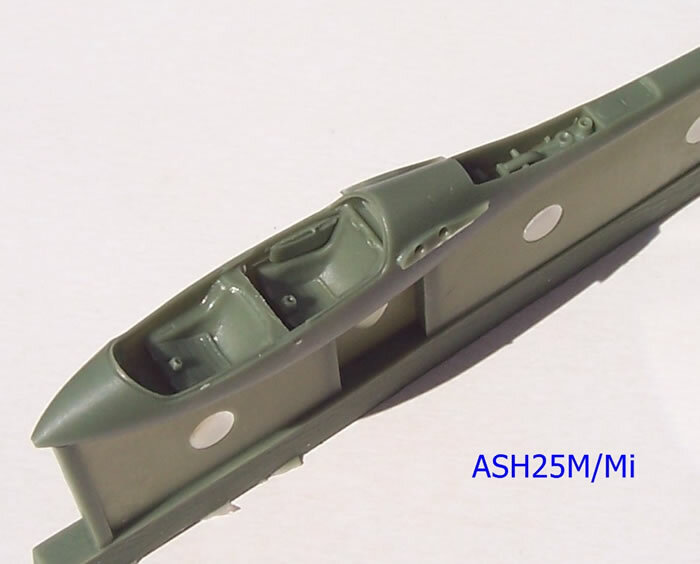 16 x green resin fuselage & tail parts, 3 x black resin propeller and undercarriage door parts, 6 x wire reinforced black resin wing parts, 2 x vac-form canopies, 2 x pre-coloured Eduard PE frets of 26 parts, 1 x Eduard pre-cut canopy mask, decals for 4 schemes. Use of wire to reinforce the thin wings. Generally simple to build with comprehensive detail and finishing information. More guidance as to which of three wing-span options should be fitted for each decal option would be helpful. Great multi-media kit. Straight forward to build airframe, but some care with small PE and resin parts also needed. Very well researched - Recommended. 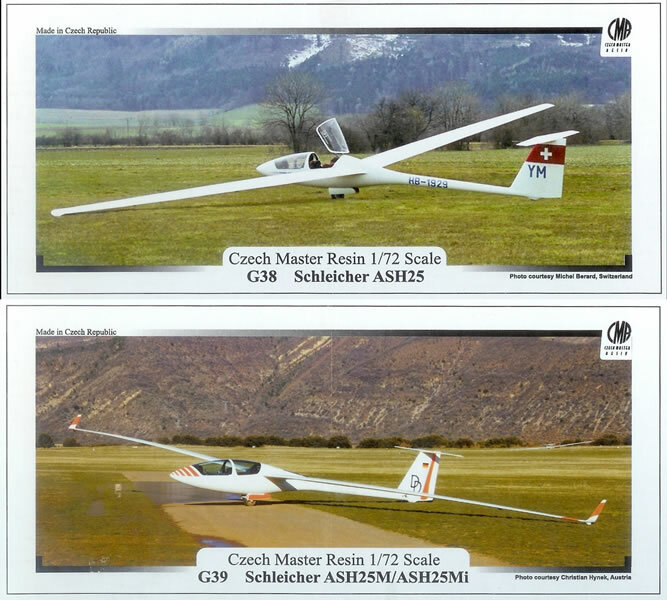 The ASH25 is a high performance two-seat glider produced by Alexander Schleicher and designed by Martin Heide. It was originally produced with a 25 metre wingspan, but versions with 25.6 and 26 metre spans were later offered. The ASH25M and ASH25Mi are self-launching versions powered by a Wankel rotary engine with a propeller mounted on an extendable pylon. 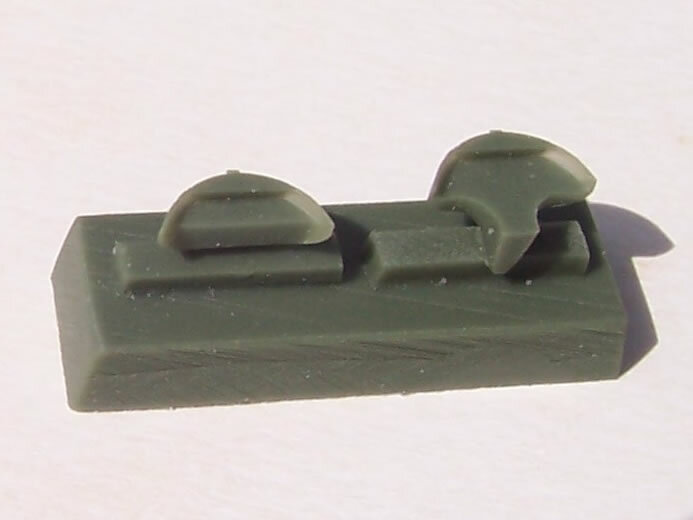 CMR must be the leading producer of glider kits in 1/72 scale with 35 civilian and military glider kits currently listed on their website. 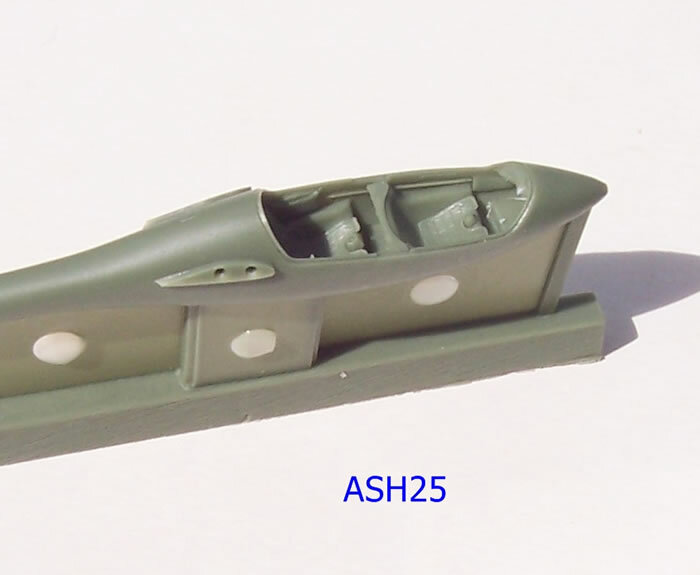 These latest ASH25 kits make nice additions to the range of modern sporting gliders already covered. The kits are both packaged in a sturdy top-opening box, and all parts are in heat sealed plastic bags. Very clear assembly diagrams are accompanied by A-4 pages featuring a walk-around of colour images. The painting and decaling diagrams are relatively simple reflecting the original aircrafts’ simple schemes. Detail colour call-outs are provided in a written instructional format rather than using colour call-out flags alongside constructional diagrams. The walk around also provide colour guidance. All instructions are in English. 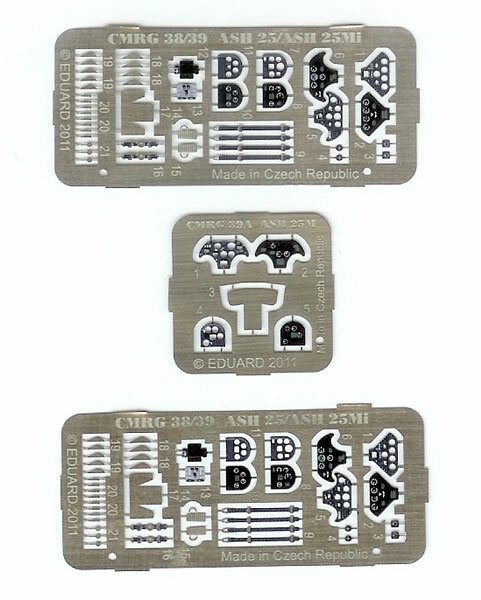 In keeping with all of CMR’s recent releases, these kits are true multi-media efforts with pre-coloured photo-etch frets and pre-cut canopy masks made by Eduard. 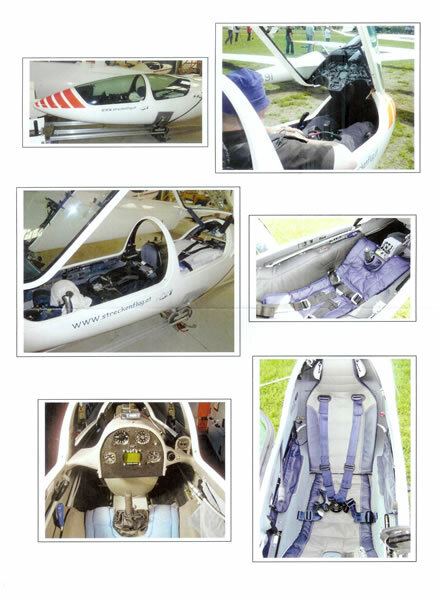 The PE enables a very high level of detail to be achieved inside the cockpit where the pre-coloured instrument panels and seatbelts should be stand out features. 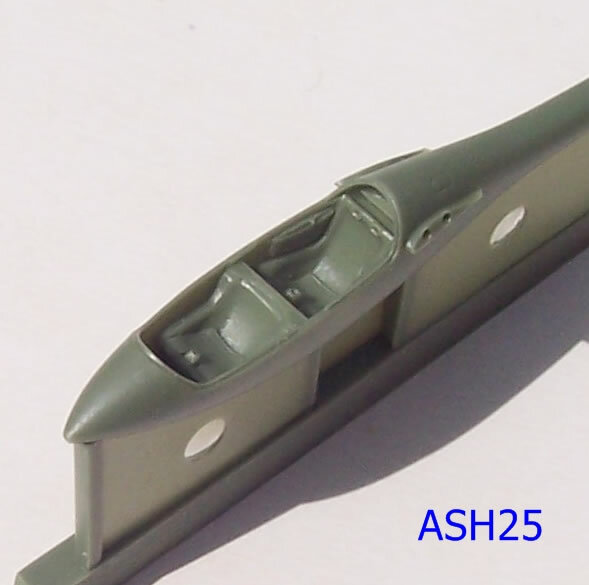 There is a choice of two styles of PE instrument panels with the ASH25M/Mi kit. 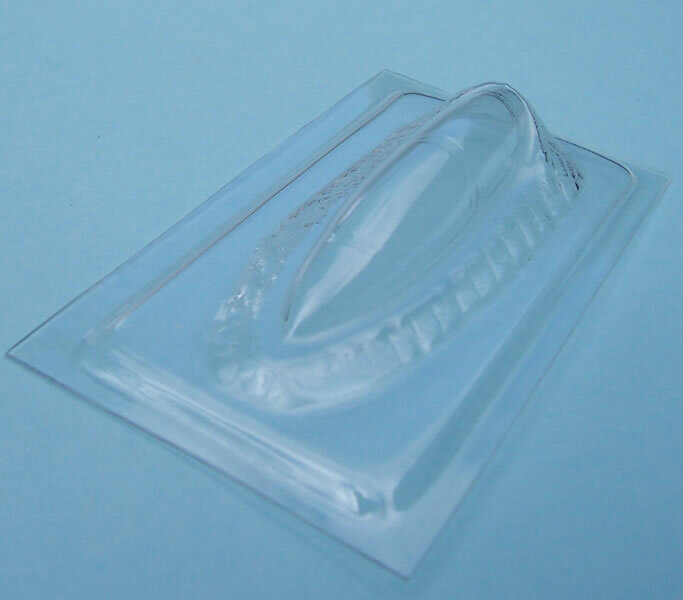 There are two very clear vac-form canopies which allows for a degree of practice or insurance when cutting out. Eduard pre-cut paint masks are provided, which is a very helpful. The kits are small and quite delicate. 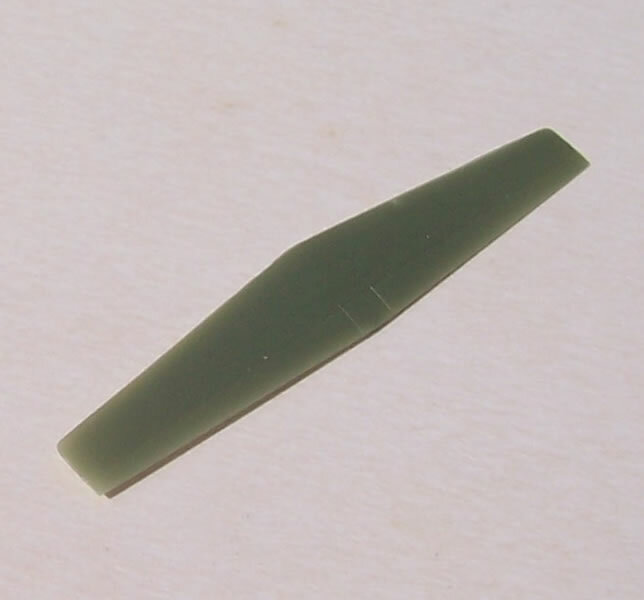 The resin parts are very crisply moulded, with very fine trailing edges. Some of the parts have minor flash that can be cleaned up in seconds. The only evidence of pinholes I could see was on the edge of the undercarriage doors for the ASH25Mi. 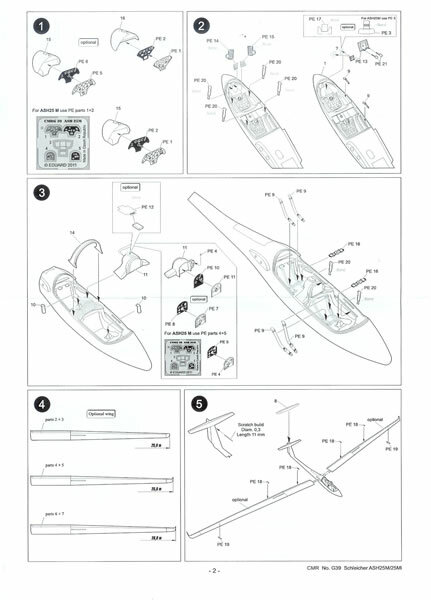 The airframe assembly is simplicity itself as very few parts are involved. 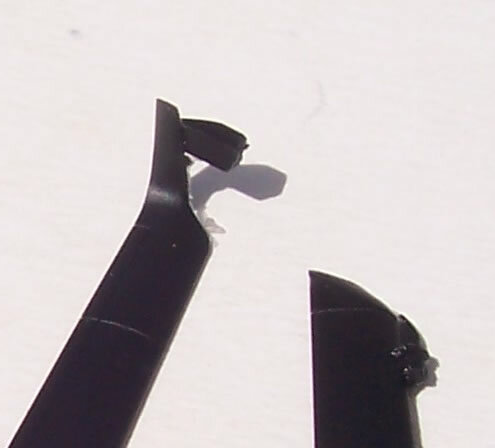 In a first for CMR kits the wings have metal wire cast in place within the wings and protruding at the wing roots. These align with holes in the fuselage, but the wire will need to be trimmed to match the depth of the holes. 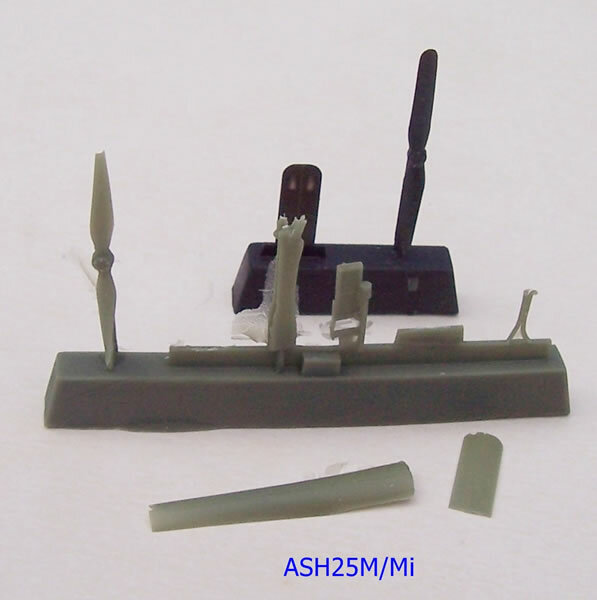 In another first for a CMR kit, the wings are cast in the extra-strong black resin normally reserved for weight-bearing struts and undercarriages. 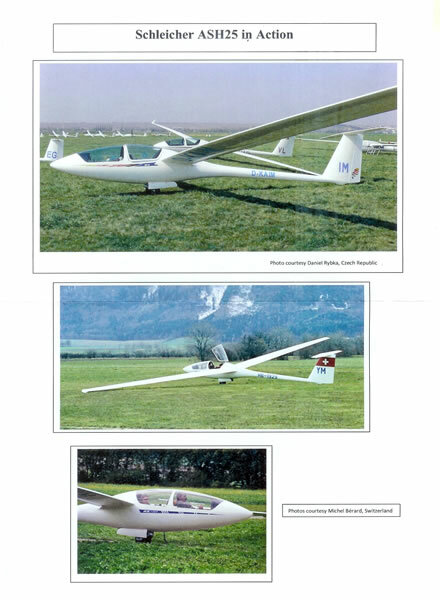 In fact there are three wings sets enabling the different span versions of the glider to be modelled. The instructions do not state which colour scheme should have which span. It may be that the glider can be fitted with alternate wings to suit conditions, and therefore any wing could suit any version, but I cannot say for sure. The painting guides do show the difference in plan-view between the 25 metre wing without winglets and the 25.6 & 26 metre wings that do have winglets. But there is no way to tell between 25.6 and 26 metre equipped versions, so more guidance would be helpful. 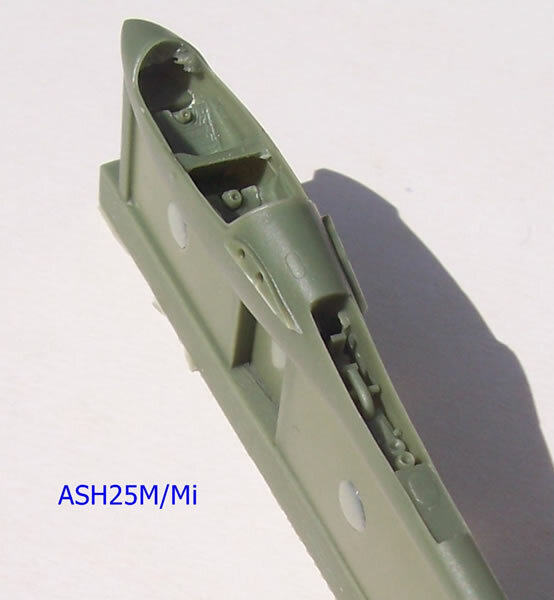 The ASH25M/Mi versions can be modelled with their propeller pylon extended. A choice of propeller style is provided to cater for the difference between these versions. 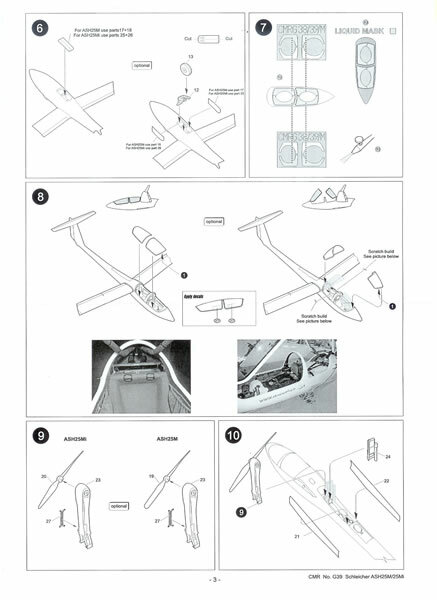 The general simplicity of assembly is a welcome feature of CMR’s glider kits. However there are some very fairly small and fiddly PE and resin parts. These and the need to cut out the vac-from acetate canopy means that some care and fine motor skills are needed too. These aspects are not too daunting, but be prepared to take some care with these kits to get the very best from them. 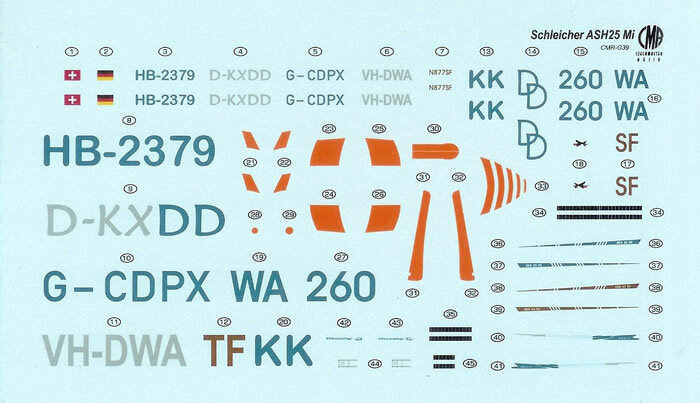 The four decal options cover for all versions of both kits are overall white, which in this case serves to emphasise the incredibly clean aerodynamic lines of the ASH25 gliders. There are various registrations and other markings, plus coloured graphics and a Swiss flag in two cases to add some interest depending on the scheme you select to build. The decals have superb registration and good colour density. They should go on very well from my own experience of CMR decals. Be aware however that they are quite thin, and must be floated into position as they can be hard to budge once positioned and tamped down. Overall these are two superb multi-media kits of incredibly delicate and impressive looking gliders. It’s obvious from the walk around images that considerable research has gone into these kits. They should build well in a straight forward manner, but some care will be needed with the small detail parts. 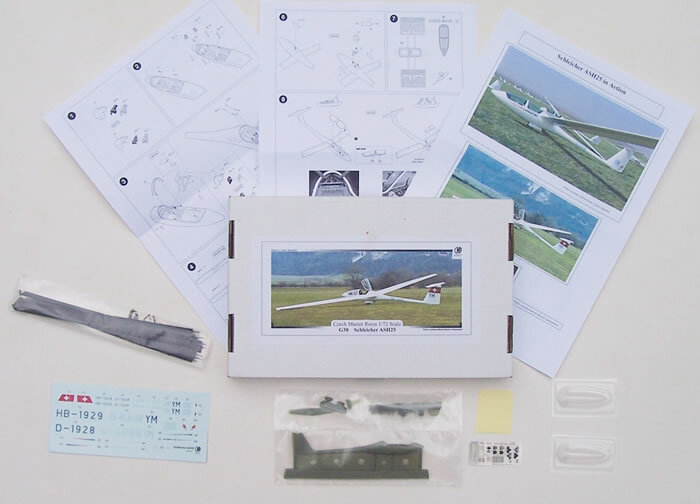 I highly recommend this kit to fans of sports gliders or anyone wishing to build something a bit different.